This Sunseeker Predator 58 is powered by twin 1999 Detroit Diesel 558kw inboard engines. 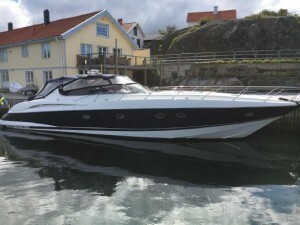 Accommodation is provided within 3 cabins on board this Sunseeker Predator 58. Forward is a large master cabin which features a centre-line double bed and ensuite bathroom with shower. To aft are two twin cabins, and a further bathroom with large shower cubicle. The saloon and galley area is spacious and streamlined, with a large curved sofa and folding table for dining. The galley area provides plentiful storage and includes a two-ring electric hob, double sink with large draining area, microwave and fridge.